You can’t be certain that too many things in life will absolutely, positively happen to you. Paying taxes to the government. Begrudgingly getting married at some point in the future. Those are “life events” that I deem inevitable. But what about career events in your life that will also make a long-term impact? Before you commit yourself to two years of drudgery and drinking, you may want to think long and hard about your decision before you take the plunge – unless you want to ruin your own life, of course. Remember When Business School Had Value? When business school offered a great ROI, I was still playing homerun derby with the neighborhood kids in my backyard. As formal education became less of a luxury and more of a necessity over the years, almost all graduate institutions saw an increase in applications. So it was only a matter of time before other educational institutions with lesser reputations started to take advantage of that trend. After all, everyone wants more responsibility, prestige, and pay, but not everyone can get into the top schools. Enter part-time business programs, for-profit schools offering business degrees, online graduate schools, Executive MBA and distance education programs, just to name a few. The US alone has more than 600 “business schools,” but not all of these are officially accredited in business by the AACSB – and even fewer are entered into the composite rankings for US News, The Economist, Financial Times, and Bloomberg Businessweek. As if choosing to attend business school weren’t already difficult enough, choosing the right program seems to multiply the pressure. And in the ranks of finance, it’s becoming less and less common to have only a bachelor’s degree – unless you already have an amazing network, specialized training, a prominent certification, or something else that sets you apart. But if you’re not careful, you could end up making a very costly mistake – not only in terms of money, but also in terms of opportunity cost, personal sacrifice, and your own life over 2 years. Usually, attending the right business school is a net positive. 1. Congratulations! You Now Owe More Than $150K+ USD in Student Loans. Here’s the short and blunt version: if you are not attending a top business school and you have your sights set on investment banking or private equity and you’re paying for the program yourself, you’re making a big mistake. Sure, if you worked in marketing for a few years, then you go to Harvard Business School and take out that $150K loan, but you land an offer at a hedge fund afterward, your earnings could easily be a multiple of what you paid in only a few years. Just one problem, though: both top business schools and those ranked well into the #80’s and #90’s cost the same amount ($50K+ per year)… and the lower-tier schools offer nowhere near the ROI that a top business school can provide. So if you have your heart set on making a “career change” into a field like investment banking or private equity but you can’t get into one of the top business schools, well, you probably want to reconsider your plans before you end up with a $150K liability. Before you sign your life away for student loans, ALWAYS do your due diligence and weigh your expected return against your initial investment. Yes, there are some paths into high-paying jobs that don’t involve attending top schools (see below), but you have to be very careful about what the school claims vs. what students there actually experience. Student loans are serious debt contracts that can burden your life well into planning for your first child’s education – and if you’re not careful, you could ruin your life before your career has even begun. Yes, business school is expensive, but if you crafted a plan prior to entering, then you knew the costs going in and accepted the challenge. You should have already planned out what you were going to do afterward before you even began applying to schools – otherwise, you’ll feel pressured to take a job because it pays well or because you are chasing the prestige of working for a particular company. I can almost guarantee that you’ll be miserable if you don’t take the time to think about what you want to do and where you want to do it long in advance. Then it’s only a matter of time before you quit, get fired, pick up a drug habit, or begin your prescription medication for medical-related problems brought on by stress and depression. NOTE: This is not a contradiction of point #1 above because, believe it or not, there are jobs that don’t induce as much misery as some of the options discussed on this site. Also, there are ways to reduce the cost if you’re attending a lower-ranked school (e.g. scholarships can be more common) and aren’t necessarily using it to move into finance. Choosing to attend business school means accepting a personal challenge. 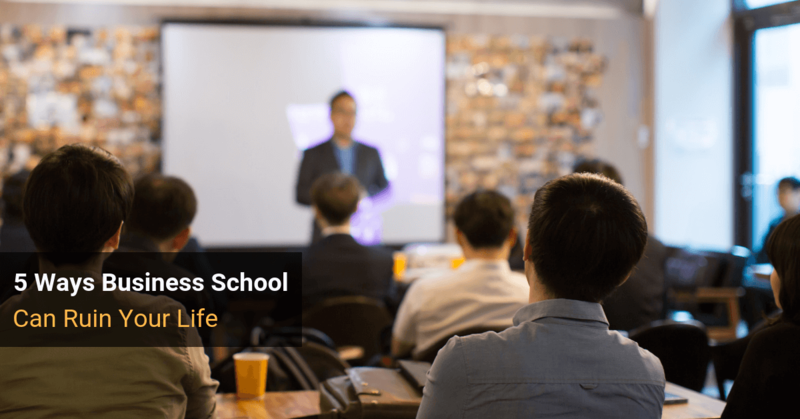 Life does not stop simply because you chose to attend business school and, unfortunately, it also means that every aspect of your personal life will be probably be compromised to some degree. You’re hungry? Great. Get used to cooking – for the time being, no silver tuna. You’re tired? Great. Sleep in the library – your apartment is only a place for you to put your belongings. You’re emotionally unstable because of the workload and interview slate? Great. Call up one of your close friends and let it out. That is, if they pick up given that you’ve virtually ignored them since you arrived on campus. Your health is deteriorating? Great. Try running to class in the morning – given that you studied or drank until 3 AM last night, you could use it. Your relationship is hanging on by a thread? Great. Cry in between employer information sessions and make an appointment to see the nearest bartender once your classes end for the day. Simply put – get ready to do the best unicycle and juggling act you’ve ever attempted. Although your professional life could be headed in the right direction, your personal life could be in shambles if you don’t work to actively maintain it. Oh, and unlike an investment banker, you won’t even get paid for this juggling act. 4. You Work So Hard That You Don’t Learn Anything. This varies quite a lot depending on the school you select. Business school is a marathon and if you don’t pace yourself, the workload, interview slate, club activities, and everything else associated with school can overwhelm and ultimately trample you. But despite rumors of everyone drinking 24/7, there’s still a huge amount of work to be completed, which means that there’s no way you can focus 100% on every single class (well, unless you want to miss the on-campus recruiting and activities). If you’re focused on finance, the optimal choices are obvious: accounting, financial markets, and investment-related courses should all be top priority. And you also need to take personal time out of your days to do ancillary reading and really master the material. You may just need to “study for the test,” and then do a mind-dump afterward to make mental space for the next class or the more relevant material. I fully support this idea – and if your professor enjoys cold calling during class, I suggest Adderall. 5. Business School is Going to Make My Career! If you were intelligent, hardworking, resourceful, and intellectually curious prior to business school, you will be the same person after – just with a piece of paper that confirms what you already possessed. If you were “second string” before business school, you will probably remain second round talent unless you worked diligently to change your habits, applied yourself, and used your time in business school to become a better professional. But business school is just a name. It may matter in terms of where you start your career, but your performance record and personal network will carry a lot more weight down the road. People from top schools still fail at start-ups, still get laid off and fired, still get passed over for promotions, and still get overworked and abused (figuratively or literally) all the time. No top-tier name insulates you from any of this. So, How Do You Avoid Ruining Your Life with Business School? But you can’t get into a top school that large banks and funds recruit at. So you go to a 2nd or 3rd tier school instead, take out $150K+ in loans, and then end up with a job that barely pays enough to cover your living expenses and loan payments. In this case, the solution is simple: don’t go to business school if you can’t get into a top program. Your company or someone else is paying for it, so you’re not assuming a massive liability to attend. You’re not planning to use the degree to change careers, but are instead looking to improve your skills and/or move up at your own firm. Both of those are potentially good reasons to take the leap, but you need to figure out all of this well in advance. But if you’re interested in going into a field like asset management, you don’t necessarily need to go to a Top 10/15 school to have a good shot at getting in. The same applies if you’re OK with working at a smaller fund of any type, or moving into a corporate development careers or the corporate finance career path at a normal company, or a lot of options outside of pure IB/PE. If you want to make a career change into finance and you can get into a top school, go there. If you can’t get into a top school, consider fields outside of banking and private equity. If you can’t get into a top school and you absolutely refuse to consider other fields, please don’t go to business school unless you want to crush yourself with $150K in loans. No, “searching online” or reading anonymous accounts from strangers on message boards does not count as doing serious research on business school. If it is not one of the top 10-15 schools that large companies recruit at, you really need to go there in-person and talk to real students to see how well they’re doing. Since there are hundreds of “business schools” these days, it’s increasingly difficult to separate the wheat from the chaff. And there’s no way to do that until you visit and see what’s happening on the ground. There isn’t much you can do about the “juggling act” unless you can eliminate some of what you’re required to do each day. Students sponsored by their companies have a big advantage here because they don’t have to balance recruiting on top of activities, classes, and everything else. Assuming that you are interested in leveraging business school to recruit at other companies, though, the best way to ease this juggling act is extreme focus. Don’t join 25 activities and also recruit for 10 different roles across 5 industries – if you cut back and focus on only 2-3 you’ll get much better results and you might even preserve a drop or two of your sanity and pre-existing personal life. The same applies to classes: while you have to get the work done, putting 100% of your effort into all your classes is rarely a good use of time. If you’re making a career change, have you completed the all-important pre-MBA internship? If not, why would any employers believe that you’re truly committed to making the change? If you’re moving into a highly competitive field like investment banking, have you already started networking with alumni months before school began? If not, how do you expect to compete with students who have, and with students who have spent years working in that field before? What if you don’t get into your chosen field? What is your “Plan B,” and is that plan still financially viable given the amount of loans you’ll take on? An MBA may not be the answer to everything – or to anything – but it also doesn’t have to ruin your life. And with the right planning, it just might be one of the few things that absolutely, positively makes a positive career impact on you. I’m an IBD analyst at an almost-BB (i.e. not GS/MS/JPM) bank and am about to be promoted to associate. Can you think of any reason MBA might still be a good idea in my case? Looks like people are applying to break in as associate but I’m getting it anyway. Reason for asking this: Have GMAT, get bored with my job, and don’t want to do PE. Thanks for the reply, Brian. You think I have a shot on “smaller” BBs? I mean, you should apply and network everywhere. Turnover is very high at most banks, so anything could happen. But you’re better off focusing on smaller firms because your chances will be higher there. Would love to know your thoughts on whether I should pursue an MBA to break in investment banking in NYC. I’ll be migrating to the US in 2-3 years. I understand networking will always play a big role in recruitment, but was wondering if firms would pay attention to me without an MBA. ??? But you already have 3.5 years of investment banking experience. Why do you need to “break in”? You could probably win a role at some type of bank in NYC, but probably not the top firms. It would make more sense to work at a boutique or middle-market bank and then move to a bigger one rather than pursuing an MBA. This is very true in India also.I did my MBA from tier 2.By gods grace it is still recoverable and imaginable figure . My question is should we after profile in tier 2 college or after company??? I mean what is the best I can get ?? If your goal is to win a front-office role at an investment bank, then you should not complete an MBA from a tier 2 school. If you have already done that, maybe think about roles such as asset management where the school reputation matters less. But I don’t think there are many AM roles in India, so you might have to consider Big 4 firms and valuation/advisory roles there instead.